There were two Fords across the river Avon between Ringwood and Christchurch. The first, crossing the river at Bisterne is Wattons Ford at map reference 136018, the second at the village of Avon is Tyrrells Ford at map reference 141998. These Fords were a means of crossing the Hampshire Avon from early times. The Ford at Avon was known as Tyrrells Ford after the year 1100. The story being that Sir Walter Tyrrell, after the shooting of King William II (Rufus) on August 2nd 1100, passed this way and had his horseshoes reversed at the local smithy, then crossed the Ford and made his way to the coast and back to France by boat. There has been much controversy as to how Rufus met his death. 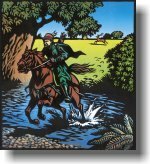 History tells us that on 2nd August 1100 a hunting party in the New Forest set out consisting of the King, Walter Tyrrell (Lord of Piox in Ponthieu and of Archéres by the Seine) lately arrived from Normandy, the Kings younger brother Henry (afterwards King), William of Breteuel, Gilbert and Roger de Clare and Robert Fitzhamon. Several versions of what happened have been passed down through the ages. The chroniclers vary conflictingly as to what happened. The party hunted till the afternoon and when the sun was setting a deer broke forth. At this, Sir Walter Tyrrell drew his bow and fired, the arrow whistling straight into Rufus's chest, mortally wounding the King. Others say the arrow glanced off of boar, off a deer, off a tree and by treachery. In any event, Tyrrell leaped upon his horse, rode away to escape with utmost speed and returned to Normandy. Henry rode to Winchester to secure the King's treasure and to make terms with the church, then rode on to London and had himself crowned as King Henry I within three days. The body of Rufus, thus deserted was conveyed to Winchester the next morning by a local charcoal burner named Purkis and unceremoniously buried. Consensus of opinion now is that the King died by design. One ancient tradition gives another reason for the violent death of William Rufus. Isabelle de Beaulieu, a ward of the Countess de Warrenne, had recently been married to Sir Walter Tyrrell (although history actually records his marriages to Adelaide the daughter of Richard FitzGilbert and Rohese, daughter of Walter Gifford Earl of Buckingham). The King saw Tyrrells “wife” for the first time at an archery competition arranged for the Kings amusement, and sending the husband away on some pretext until the next day, managed to possess her. When Tyrrell returned she told him and stabbed herself to death. The same day Sir Walter, concealing the death of his wife from the King, accompanied him to the hunt and shot him in the New Forest glen, afterwards fleeing by way of Tyrrells Ford to the coast where he managed to get across to France. Sir Walter Tyrrells clever deceit in reversing his horseshoes prior to crossing the river Avon at Tyrrells Ford was effective, as he was never punished for the death of Rufus. In fact, the new King Henry I showered favour on Tyrrells relatives in England and he never lost any of his estates. Lord Manners, who now latterly owns the land around this area, used the name "Tyrrells Ford" for his 18th century house. 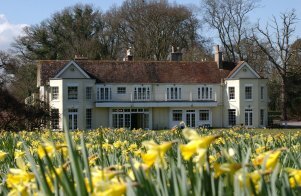 It is this former residence which has now become the Tyrrells Ford Country Inn hotel - to be forever associated with the story of Sir Walter Tyrrell and the death of King William II Rufus. Pay us a visit and feel a part of the history for yourself. Drop in for a drink or enjoy a meal prepared by our award winning chef. Our friendly staff will afford you a warm welcome any time you call. If you enjoy sightseeing whilst staying with us, you can visit the Rufus Stone in ancient woodlands at Canterton in the New Forest (OS Grid Reference: SU 271 126) which is 13½ miles by car from the Tyrrells Ford Country Inn, (20 minutes). Sir Walter Tyrrell would have ridden his horse the direct route of 11 miles across country to get to the Tyrrells Ford and it probably didn't take him much longer in time! If you enjoy walking, then why not follow part the Avon Valley Path which takes you alongside the Tyrrells Ford Country Inn and hotel? The Avon Valley Path is some 34 miles long and takes you from Salisbury through Downton, Fordingbridge, Ibsley, Ringwood and Sopley, down to the coast at Christchurch. The Ringwood to Sopley part of this picturesque walk is just 6½ miles long and takes you past Bickerly Common, over water meadows to Kingston North Common and past Wattons Ford on to Bisterne Church, continuing on through woods, fields and a stream leading to Tyrrells Ford west of the path.